When you look at all of the information out there on keto it can get quickly overwhelming. Eat this, measure that, track this and never ever eat this. There are so many opinions on what is the right thing and what is wrong. The truth is that there is no absolute right or wrong when it comes to keto only guidelines. These guidelines have been established by experience. The experience of doctors, nutritionists and people who have been thriving for years on keto. I only ever share my knowledge and experience as being what has worked for me, not necessarily what will work for everyone. Trying to work out what will work for you might seem like a huge undertaking but it doesn’t have to be. Starting out can seem daunting but I encourage you to just start and work as you go along. It doesn’t have to be perfect, nothing ever is! As long as you’re making adjustments as you go alone you will be successful. Start with the very basics by counting just your carbs. Whether you decide to eat net carbs or total carbs, you’ll quickly get to know how many carbs you can eat once you’re tracking. Start with an app such as Carb Manager or My Fitness Pal and simply enter everything you eat. Both apps are populated by the people that use them and as the majority are still focused on calories some entries are missing carbs, fats and proteins so just check the entry before you use it. When you start to add in your food to track the carbs, the fat and protein are also worked out for you. Once you’re tracking your carbs and feel confident you can start to look at protein and fat. In the first few weeks it’s not necessary to try to reach your protein goal or look at fat intake. It’s important that you learn to manage your carbs first and if you eat more fat than protein or vice versa during those first weeks it ultimately won’t make too much of a difference. Once you get the hang of the carbs, the fat and protein will become easier to work out. Hunger should be treated with fat and once you work out your protein goal and since you’re already tracking your food, it’s much easier to then see your protein goal and adjust as needed. 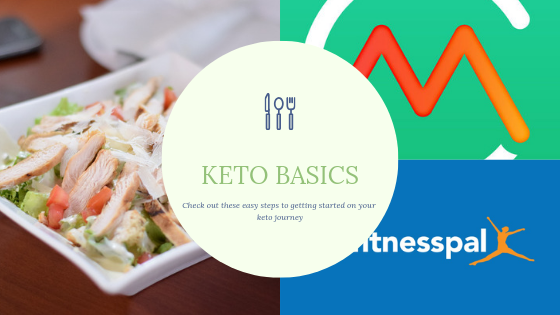 STILL FEEL THAT YOU NEED SUPPORT STARTING KETO? 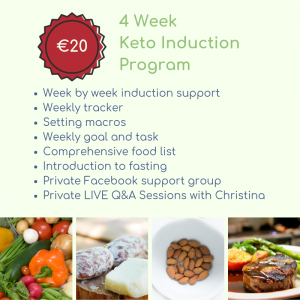 SIGN UP FOR MY 4 WEEK KETO INDUCTION PROGRAM. EACH WEEK AN eBOOK WILL BE DELIVERED DIRECTLY TO YOUR INBOX TO HELP YOU GET STARTED.